Climate Change: Off the G-20 Agenda? Climate change groups occupy a central place among G-20 protests in Pittsburgh. 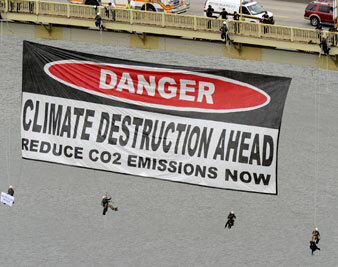 Protesters hang a sign from the West End Bridge before the start of the G-20 summit, Sept. 23, 2009 in Pittsburgh. Editor’s Note: Follow Rob Eshelman‘s dispatches from the G-20 summit in Pittsburgh at TheNation.com all week. Tuesday afternoon, US District Court Judge Gary Lancaster rejected a request by the ACLU of Pennsylvania and the Center for Constitutional Rights for an injunction against the Pittsburgh Police. The lawyers alleged in the suit that local law enforcement has been systematically harassing and carrying out unconstitutional searches and seizures of members of two G-20 protest groups–the Seeds of Peace Collective and the Three Rivers Climate Convergence (3RCC). The judge refused to restrain the police and suggested that if police conduct warrants damages claims, then the ACLU should file suit. The ACLU says it will pursue such claims. Despite yesterday’s legal setback, climate change groups such as 3RCC and Greenpeace have continued to occupy a central place among anti-G20 protests in Pittsburgh during the run-up to the summit. The actions of climate change campaigners come at a critical time: climate scientists are issuing ever more dire reports about the pace at which global warming is occurring, and there are now just seventy-four days before the Copenhagen climate talks. Today, activists from Greenpeace rappelled from Pittsburgh’s iconic West End bridge, hanging an eighty-feet by thirty-feet banner that read: Danger, Climate Destruction Ahead, Reduce CO2 Emissions Now. Nine people were arrested during the action, in addition to five others during an earlier, unsuccessful banner drop. Moglen added that it was important to situate the G-20 meeting not only as occurring two months before the Copenhagen conference but also two days after the UN Climate Change Conference in New York City. “Obama missed an opportunity with his speech before the UN yesterday,” Moglen said. “What was striking about his speech was the complete lack of commitment to ambitious emissions reductions.” Many countries, including Japan, have recently put forward bold new reduction goals consistent with the IPCC’s recommendations for 25 to 40 percent emissions reductions by 2020. Obama called for reductions that fell far short of what other nations have proposed, and the science-based IPCC recommends. “It appears that Obama is preparing for a race to the bottom,” Moglen added. Three issues will likely dominate G-20 discussions on Thursday and Friday: boosting the level of capitalization of banks, reigning in executive pay and developing a coordinated strategy for reducing economic stimulus programs. That climate change may be an afterthought, at best concerns many climate change activists I’ve spoken with the past several days. “Time is increasingly short and there’s an enormous amount of work to be done,” said Steve Herz, also with Greenpeace. During the summit, many environmental groups, including Greenpeace, have been pushing for greater public investment in economic stimulus programs that encourage alternative energy production. A recent report authored by Greenpeace and the European Renewable Energy Council argues that a boost in renewable energy production could support 8 million jobs by 2030. Meanwhile, 3RCC has been working to connect the G-20 summit not only to concerns over global warming but also to ecological devastation caused by mining in areas around Pittsburgh, particularly the Appalachian states. Yesterday about two dozen protestors picketed coal industry executives, in town for an international coal conference and headed to a Pittsburgh-based research and development facility for demonstration of “clean coal” technology. As delegates boarded a bus, the picketers shouted, “Clean coal is a lie” and “Sequester greed”–an allusion to carbon capture and sequestration. As Eileen O’Conner, an attorney representing the Norwegian company Sargas, spoke with print and television reporters about the tour, protester Lisa Fithian held out two large, dark clumps of wet coal, seemingly offering them to the well-dressed spokesperson. “The coal is already down [in the ground]; why would we take it out of the ground and then put it back?” the protester asked. Morgan Goodwin, a spokesperson for 3RCC, explained the connection between protesting the coal industry and the G-20: “There’s collusion between these groups, not only because they’re meeting together in Pittsburgh but also in their policies.” An international climate agreement that reduces greenhouse gas emissions is essential, Goodwin said, but was unlikely to happen, given the links between international finance, politicians, and the coal industry. 3RCC is planning a protest for this evening at a clean energy jobs fair, and a climate march is scheduled to feed into Friday’s broad-based demonstration of the G-20 summit.